BTS reaffirmed its seat on the throne as the K-pop kings, taking home the grand prize at the 27th Seoul Music Awards on Thursday. It capped off an impressive run for the K-pop juggernaut, which had already taken home the grand prize at the Golden Disc Awards earlier this month, along with artist of the year at the Mnet Asian Music Awards and song of the year at the Melon Music Awards in December. 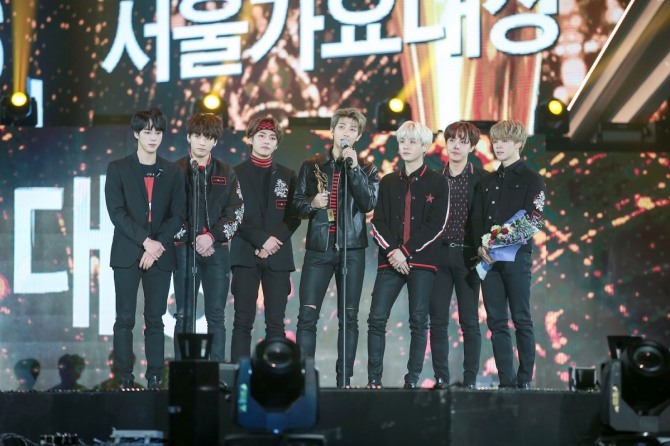 “We started off small -- the seven of us -- because we liked music and we admired those on stage, and that led us here,” the band’s leader RM said after receiving the award, thanking BTS’ official fan club Army. IU took the record of the year award with “Palette,” and Yoon Jong-shin’s “Like It” took song of the year. The best new artist award went to Wanna One, Chungha and Pristine, while EXO took home a Hallyu special award. The Bonsang award -- which recognizes top K-pop artists of the last year -- went to BTS, EXO, Twice, Red Velvet, GOT7, BtoB, Black Pink, Nu’est W, Bolbbalgan4, Seventeen, Wanna One and Super Junior.